Build a cordial and lasting relationship with your customers with our CRM software. Manages clientele data and information. Provides marketing and customer support. Connects the entire team from any device. Delivers recommendations and simplify repetitive tasks. CRM (Customer Relationship Management) Software performs a critical role in the automated marketing approaches of present-day businesses. The best CRM for contemporary marketing environment is that which provides an easy to use, compelling and reliable service. So that the owner can manage his business systematically and more effectively. CRM software from iOSS is a state of art featured software of its category that comprises a wide set of applications and tools designed to assist companies in managing Clients data and their interaction, access business information, automate sales, marketing and customer support and also oversee employee, vendor and business partner relationships. Usually, CRM software is employed by enterprise level companies, but these days, it is extending to businesses of all sizes. What does our CRM Software do? Our CRM Software provide so many customer centric tools that other CRM Software’s can’t match. This smart tool facilitate your efforts in pursuit of right prospect in the initial stages of conversion. It’s easier to retain a customer than to acquire a new one. 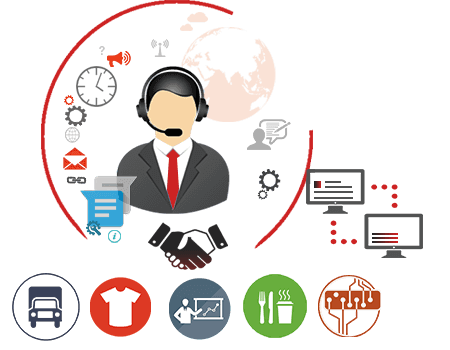 The advanced help-desk system helps you increase customer retention. Reach out to your customers over the phone, email, chat or social media. Measure the impact marketing activities have on customer acquisition. Empower your marketing team with better visibility on how ad spends relates to revenue. © Copyright 2019 by IOSS. All Rights Reserved.